Day 2 was tough. Not with regards to the conditions, or because my sailing shoes that I left out to dry next to our dock box are now missing, but because of the mental toll of being in the mix in all three races, and finishing with results that have left us ahead of just 1 boat in the overall standings. As the Russians on the boat next to us again celebrated another top day with champagne and interviews from the local media, a few of us sat on a stack of sails on the dock in a daze, thinking about what we can all do individually to improve our performance. The effort on the squad is solid and there is no lack of determination, but to polish off our finishes we need to get better in all three areas of speed, tactics and boathandling, and figure out how to capitalize on decent starts and first beats. With first windward mark roundings all in the top 10, we have the capabilities to hang in the middle of the pack, but as is all too common with racing in a fleet like this, any hiccup puts you to the back of the back where it is tough to recover. The RC postponed racing until 1pm for the sea breeze to fill, and when it finally did, we were able to get off 3 races in a 9-14 kt Westerly wind. This was further right that we had seen up to this point, and with the breeze going up and over the city of Gaeta, there was a big geographical shift in the right corner, and the boats that could get to the right first and dig in always did well. Not understanding how big of a benefit it would be to get to the corner and having to sail through a 20 degree header to get there, we tacked short of the corner a few times and looked ok, only to have the boats that crossed behind us extend further and round ahead of us at the top mark. Sometimes it pays to just put the blinders on, forget the data you normally rely on like compass heading, and put the boat where it needs to be. There are 2 races left and we are looking to continue to improve in all phases and hopefully we can move up the standings a few points. After a delay getting off the dock due to our provisions not arriving on time and having to run across the street to ensure we had enough food and water for the day, our team headed out the race course in a nice 8-11 kt SE wind. Up to this point in our practicing, the breeze had all been out the SW, so collecting new data on this direction was an important part of our pre-race routine. With an eager fleet, and strong 1 kt current that was pushing towards the line, there were a few general recalls, and on the 4th attempt we were able to get off under a Z Flag start. Unfortunately for our team, in the previous general recall which was also under Z, we were nailed for being one of the boats over would carry a 20% penalty into the race (3 pts). I was a little suspect that we were over as our Velocitek was reading that we were 20+ meters from the line, but we were exposed on the line early and gave the RC a good look at our bow numbers for a long period of time before we dipped for the start. As for the race, we got a clean start to leeward of the group and extended to the left side of the track. The fleet split early and as our pack got close to the left layline, we began to get headed with pressure and were able to tack and cross the boats from the right. With a few tacks at the top of the course and battling with the other boats from the left, we managed to get around the top mark in 3rd, and we took a 5th at the finish after losing 2 boats on the 2nd upwind, but a solid start to the regatta regardless. With the current still ripping up the race course, which I am told is very unusual here, and a dying breeze, we were put under postponement for a good 3 hours. It was clear the RC was determined to get another race off, and after relocating the course closer to shore, a few clouds rolled in and brought some new breeze and we were able to get off another start at 4pm. With 2 more general recalls, the 3rd start was under a black flag. As was the theme for our team, we were again the most advanced with the boats around us, exposed near the committee boat and very close to the line with too much time to kill. With fear of being called over with a black flag, we pulled the plug and gybed out, took 3-4 transoms on port and started late at the boat. With the way the fleet was pushing the line, I thought for a moment it was going to be another general and that we would be one of the few boats not called over. But as we crossed the line late, the RC came over the radio and announced, “All clear.” We were a bit deflated as starting in last is never a great outcome, but the team kept plugging away and we fought hard to get back in the game, caught a few shifts and round in 8th at the top mark. At this point the breeze that had filled began to die again and it was a roll of the dice as to which side was going to pay, and being fast through the water was a priority. We were sticky at a few points on the 2nd upwind and last downwind, and compounded with a crowded leeward gate rounding we lost a few boats and took a 13th. Despite a tough last result, it was not a bad day as we battled hard and were in the mix in both races, and we completed our goal of improving from when we started the day. Our items for improvement heading into day 2 are to minimize the unforced errors and to make our approaches to the starting line much later as we were consistently the most advanced boat on the starts, and working on more consistent speed up and down the course. Day is forecast for a solid seabreeze to fill around noon which should provide for 3 solid races. Check out some great photos from Carlo Borlenghi. Traveling to a regatta in a far off destination is inherently exciting; claiming new territory on a map of waters sailed, being surrounded with a new culture, and my personal favorite, local food. But there are also general challenges when traveling abroad. Boatyards do not get anymore exotic, and with language barriers asking for acetone from the chandlery employee can turn into an exciting game of charades. There are more startling reminders of being abroad when discovering the “C” on the shower handle does not stand for “cold”, but “caliente”. And Italians are not nearly as obsessed with being connected to the Internet resulting spotty Wifi, and any Internet seekers at our team house cluster together in 4 X 4 ft area to get a signal. If anyone is caught taking up bandwidth to peruse facebook or check sports highlights, there is a good chance their device will get chucked over the balcony into the Mediterranean. Maybe we should take a cue from the locals… relax, have a cappuccino, and a conversation. Our team on USA-208 has had 3 solid days of sailing to get ready for the 1st Audi Melges 32 European Sailing Series Event, and while we are far from peaking and being at top performance, we have improved each day and judging by the practice races, when we put it all together and don’t have any majors, we have the capabilities to hang with the top group. Whether we can execute on race day will be a different matter, but we are feeling ok heading into Day 1. I have had to make a few adjustments in my head from calling tactics on a Melges 20 compared to a Melges 32, mainly being the amount of moving parts it takes to do a maneuver. I need to balance my urgency to put the boat in a certain place, with the amount of time and distance needed for the team up front to execute a clean tack, gybe or mark rounding. A big difference between sailing in the US and in Europe is the level of exposure and public interest that sailing carries. 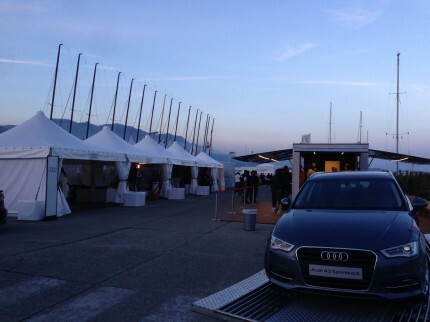 For this event, an empty parking lot has turned into a full regatta village complete with a competitor’s lounge including an exercise room (I prefer to sip espresso outside of the exercise room), a café and bar, several vendor tents, a booth with a live broadcasting radio show, and at least a dozen brand new Audi(s) on full display. On Thursday afternoon, there was a sponsor supported parade and practice race where each team was required to take out a member of the local sports academy to help draw the local media. Our team was presented with 6’6”, 220 lb Stefano, who was a member of the Basketball team at the sports academy. Stefano was nice, but we were a bit disappointed when we found out he couldn’t even dunk. Our disappointment was compounded when our neighbors on the Russian boat were set up with a 110 lb female gymnast. The sailing in Gatea is awesome. Medieval Gaeta extends into the ocean on top of a 200 ft cliff, and in the distance is the archipelago of the Pontine Islands that were at one time home to prisoners of Pontius Pilate. With our racing area just in the lee of the cliff, there will be some exciting racing and plenty of lead changes. The forecast is for warm spring temps which should result in a decent 8-11 kt sea breeze. 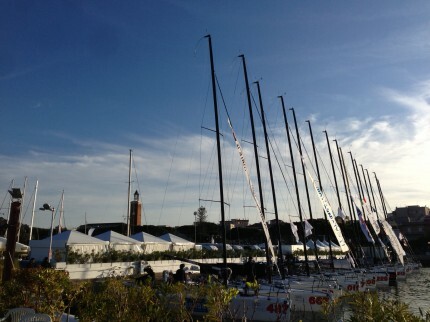 Check out the Melges32.com website for updated results and photos. 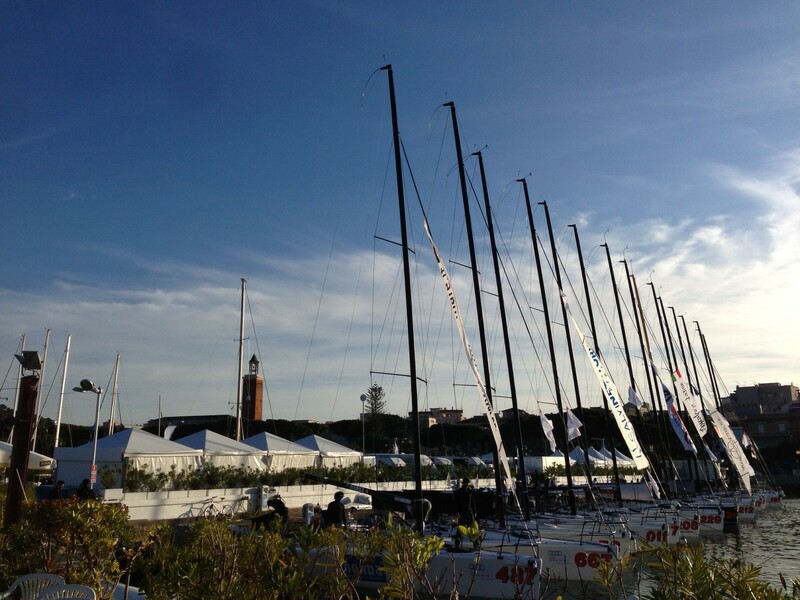 Melges 32 lined up and ready for action in Gaeta. 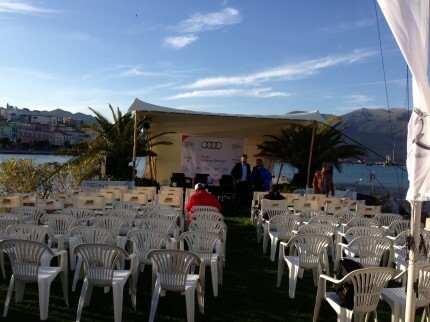 Empty chairs at 6:30 for the start of the Skippers Meeting which started a normal 30 mins late. 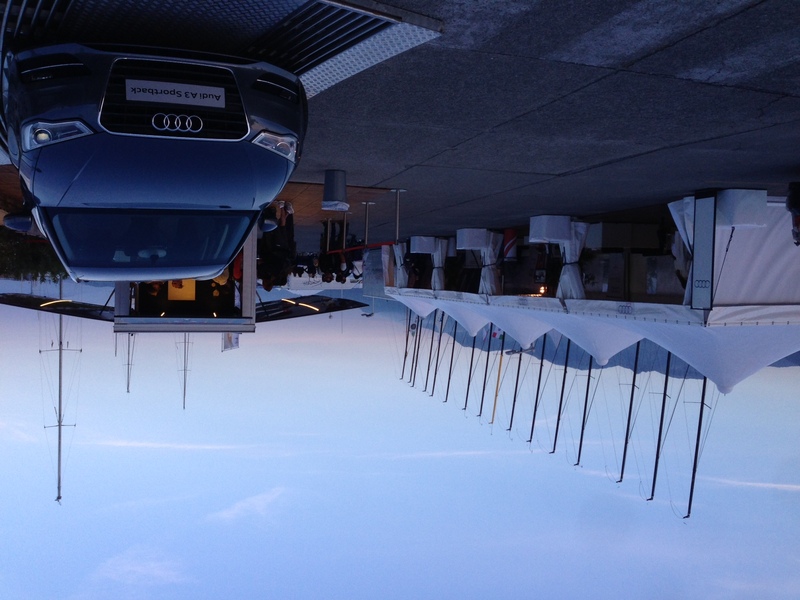 A view of the race village as dusk with the 32s behind, and one of the new Audi(s) on display. My departure from MSP to Rome marks the start of a 3 week regatta stint that will span Gaeta (Italy), Charleston, and Peter Island in the BVI’s. Jenny and Lily dropped me at the airport and as I competed for Lily’s affection with her Cinderella coloring book, we said our good-byes. Being away from the family and home is hard, but the tough feelings provide motivation to put in the extra effort and make the time away worth it, and hopefully come home with 3 solid results. I settled into my seat for the long travel to Rome via Amsterdam, and surveyed the oncoming passengers guessing at who would be my seat-mate for the 8hr first leg. It seems on any international flight there are certain staple passengers; the grungy backpacker who has not showered in 10 days, and is venturing off to his 3 continent in 2 weeks. Or the retired couple adorning their fanny packs, passport carriers dangling from their necks, and a level of excitement that will be settled by any sort of sleep aid. And of course, the Chinese tour group all sporting their dust masks hoping not to catch and transmit the next global pandemic. Finally, I spot my seatmate as she sets her down her belongings and gets settled…a petite woman in her 60’s smelling of potpurri. Perfect. Just as long as she keeps her boney elbow on her side of the armrest, things are shaping up nicely. Waiting for me in Rome will be Malcolm Gefter and a few of the other team members on USA-208. Malcolm has shipped his Melges 32 to Europe for the summer and the plan is to campaign all of the European events (sans Palma), and ramp up for the Worlds at the end of September. With enthusiasm and energy to learn and compete hard not matched by many Melges 32 owners, Malcolm is dedicated to improving on their results from previous seasons. We will have a lot of work to do this first event to get our new team sorted, communicating and performing well in the areas of speed, tactics, and boathandling, but with a young, gritty squad, we should be able to make some headway. With this new information in hand, my initial surprise gave way to excitement about the new role on the 32 and the challenges it presents. Having had the opportunity to sail with a lot of great tacticians over the past few years and learning from them will hopefully prove valuable, and at the very least, I will do my best to remember the fundamentals of putting the boat in places to let our speed go to work, get off the starting line cleanly and stay on the lifted tack…its just that easy. With a few solid days of practice scheduled with Coach Ed Adams, the plan is to get our body clocks on track, and make sure we are tuned up and ready to start racing on Friday. There will be 16 boats on the line, all high caliber and hopefully we can put some teams on notice. We will have to wait on enjoying some fine Italian pizza and wine until we make weigh-in on Weds. 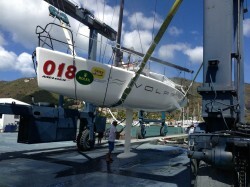 Check out Melges32.com for an updated crew list. A common refrain from regatta organizers and sailors when venues experience conditions outside of what has been advertised is, “It’s never like this!” This phrase could be heard the first few days at the St. Thomas Rolex Regatta where sailors were hoping for consistent 15-18 Easterly Trade Winds, but were instead tested with a fading gradient wind that staved off the reliable trades making for light, shifty and toasty sailing. While the Caribbean is beautiful and the sailing unparalleled, when the wind shuts off it gets sweltering, and pounding fluids and reapplying sunscreen before and after every race is more than just a cautionary recommendation. With several other fleets racing, the Melges 32’s were given our own racecourse on the Pillsbury Sound nestled between St. Thomas and St. John which provided a lot of current, ferry traffic and changing conditions. The current was a huge part of the equation and often made for a one-way track both upwind and downwind putting a premium on finding the favored end of the starting line. With starts that either had us quickly behind the fleet, or poked with the group around us, we had a mixed bag of results through the first two days. The final day, the RC moved our course to the south side of St. Thomas hoping for steadier wind which we found in the 11-15 kt range. Starting aggressively, we got off the line cleanly, got our bow out, and had 2 solid races and climbed the leaderboard. Having a decent last day and stringing together good races was a nice feeling that we have not had on Volpe for the last few regattas and we are hopeful to carry this momentum into the final Caribbean event in April. When the final finishing gun sounded Volpe finished 4th overall, and our teammates on Delta took overall honors after a well-sailed series. More impressive was after suffering a 2 mid-fleet finishes on the final day and tied with Argo headed into the last race, the team on Delta pulled it together, got the win and a nice Rolex for Dalton. After years of hard-work, crew changes, and results not reflective of effort, it was great to see Delta get the win. 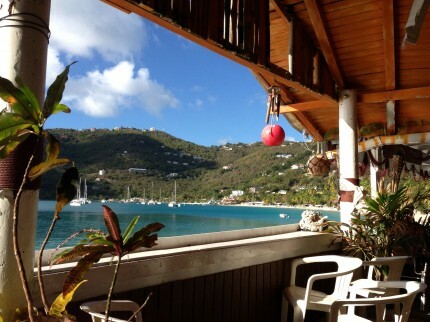 The morning following the raucous awards ceremony at the St. Thomas Yacht Club, Peanut (boat captain-shore crew) and I were the lone rangers finishing the pack up of both the DV Sailing 32s in preparation for the Peter Island event in April. 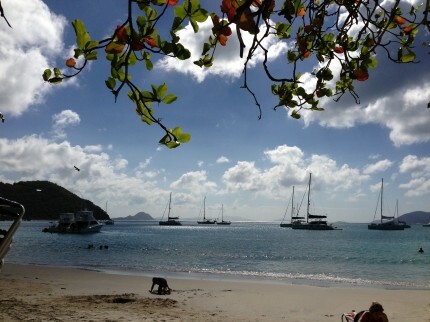 This involved towing the 32’s to Tortola, and hauling out at Tortola Yacht Services in Road Town which has firmly planted itself in the top 3 most ridiculously hot places I have ever been (#Chaffage). 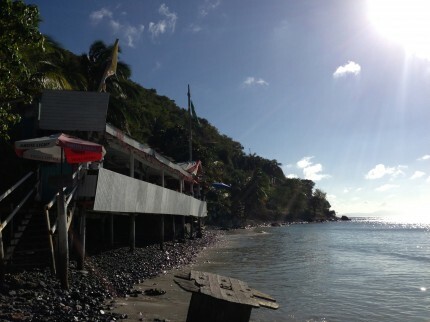 Starting at 7am, we were able to get our work done before the temps got too unbearable, and had a few spare hours on Tuesday afternoon to check out Tortola. Peanut was not feeling my Bourdain-vibe of getting in a taxi and exploring for 3-4 hours, so I ventured alone, found a taxi driver named Crabbe who dropped me in Cane Garden Bay, a white-sand, crescent-moon beach with a smattering of shack restaurants and bars mixed with palm trees. Strolling among a few pockets of beach goers and being envious of the cruising sailboats at anchor filled with families and friends reveling in paradise, I ended up at the far end of the beach at the Callwood Bar (part of the Callwood Rum Distillery). Climbing up the rickety staircase leading from the water, I surveyed the empty scene inside and was summoned with a warm welcome from the dread-locked silhouette of McAdoo, the lone employee who was viewing the action on the Bay with a pair of binoculars from a shaded corner of the deck. 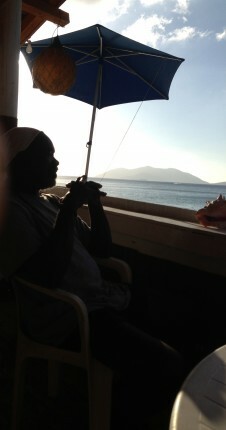 I pulled up a chair and over the next few hours and a few rum punches, McAdoo filled me in on his adventures of growing up having never left Tortola, and I shared stories of snow, ice-skating and traveling on airplanes. For two strangers from different worlds, there was effortless conversation and laughter, making for a worthwhile afternoon of aimless traveling.